You are browsing the Blog for Humphrey Obuobi. This weekend, Texas Torque traveled up to St. Louis, Missouri for the final event of the FIRST Robotics Competition season — the FIRST World Championships. The team was excited to attend the championship event for the fourth year in a row, having triple-qualified for the championship this year via the previous World Championship, a Regional Chairman’s Award, and a “wild-card” at the Lone Star Regional. After the fourteen hour bus ride, Texas Torque team members spent time in both work and play, taking time to enjoy the city in the midst of competition responsibilities. A group of our students and mentors took short walk over to the famed Gateway Arch for some pictures and relaxation before the first day of competition. We were glad to see FIRST take the city by storm; in every restaurant and attraction, another FIRST Robotics Competition team could be found leaving their mark. The Edwards Dome itself was bustling with over 400 FRC teams preparing their robotics for inspection, running practice matches, and generally enjoying the sights, sounds, and attractions of the FIRST World Championship. The much-anticipated qualification rounds began with excitement, and Texas Torque won their first four qualification rounds handedly. Every member of the team was excited to play with and against some of the best teams in the world. While the first day of qualification matches ended with an astounding 4-1-0 record, communication issues with the robot plagued our performance in the second day, leading to a final qualification record of 6-4-0 and a final ranking of 31 out of 100. Upon alliance selection, Texas Torque was chosen as part of the 5th seeded alliance, playing with FRC 2590 (Nemesis), FRC 1625 (Winnovation), and FRC 3467 (Windham Windup). The elimination matches were easily the most intense matches that we played during the 2014 season, and in a riveting final match with the 3rd seeded alliance, Texas Torque came out on top of the Archimedes Division, making this the team’s 2nd year in a row advancing to Einstein Field. On Einstein Field, the Archimedes Champions faced off against a powerful alliance led by FRC 254, The Cheesy Poofs, losing against the eventual 2014 World Champions. Overall, the team is ecstatic with their performance at the World Championship. We would like to congratulate FRC 254, FRC 469, and FRC 2848 for their inspiring play on the field and their new status as the FIRST Robotics Competition World Champions. We would also like to congratulate FRC 27, RUSH, for their induction into the FIRST Hall of Fame and their sustained influence on the FIRST community. Many thanks to our alliance partners for a fantastic run, and to all of the hardworking individuals and organizations that made this Championship possible. It’s that time of year again — the 2014 FIRST Robotics Competition World Championship event (CMP) is almost upon us! Despite having already qualified for the World Championships by winning the event in 2013, Texas Torque made an effort to “triple-qualify,” winning the Chairman’s Award in Dallas and advancing to the finals at the Lone Star Regional. Throughout this season, the team has run through many trials that have overall increased our potential for success. 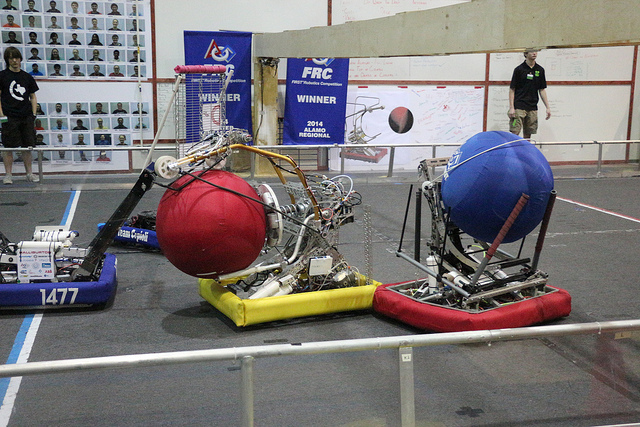 Following a rocky start to the season in the Dallas Regional, the team made thorough improvements in both subsystem elements and driver control. 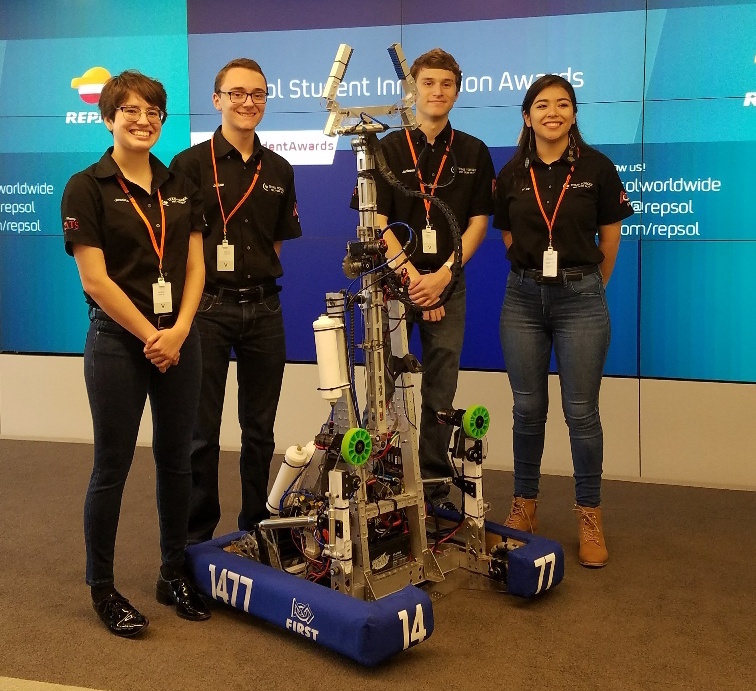 Apart from Torque’s second regional, the team has traveled to the Johnson Space Center on multiple occasions for drive practice with other teams, simulating matches to build priceless experience on the field. After the past seven weeks of competition, we can confidently say that we have made all of our preparations for the World Championships, from preparing our Chairman’s presentation to making necessary adjustments to the robot and strategy. We hope to have a grand showing in St. Louis, and can’t wait to see our fellow teams at competition! 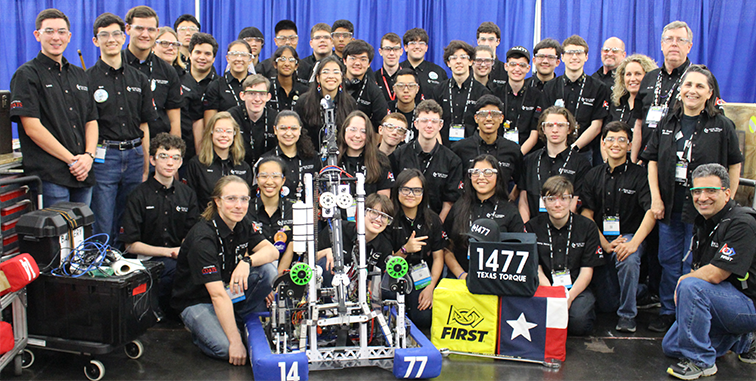 This past weekend, Texas Torque took part in one of the last FIRST Robotics Competition (FRC) Regionals in the 2014 season: the Lone Star Regional. Of the 15 years that the Lone Star Regional has been active, Texas Torque was proud to make this their 11th appearance — and a solid one at that. Sixty-seven teams were present, including two teams from China and three teams from Mexico. The team quickly reaped the benefits of the two weeks of fixes and practice between the Dallas Regional and this event, winning the first match 231 to 16 with longtime partners, FRC 624, CRyptonite. Throughout the first day of competition, Texas Torque only lost one match. The second day brought even more successes, as Texas Torque won every qualification match in the morning. By the end of the day, Texas Torque was ranked 2nd of the 67 teams at the regional, falling beneath FRC 148, Robowranglers, by only 20 Assist Points. In the alliance selection, we were elated to welcome CRyptonite, our historic partners, as our first pick on our alliance. The pair decided to pick FRC 3997, The Screaming Chickens, to complete the alliance. In the elimination rounds, Texas Torque, CRyptonite, and The Screaming Chickens won the quarterfinal and the semifinal rounds handily. Semifinal 2-2 was especially intense, as the 2nd seeded alliance set the high score of the regional without fouls (275). In the blink of an eye, the finals were upon us, and our 2nd seeded alliance was up against the 1st seeded alliance of FRC 118, FRC 148, and FRC 2585. Both alliances played at their best, but in the end, the first seeded alliance came out on top. Torque fights past FRC 148, the Robowranglers, for the ball. Texas Torque was glad to bring home the Industrial Design Award and a Finalist trophy. In addition, Texas Torque congratulates FRC 3103, Iron Plaid for their Engineering Inspiration Award, and FRC 3847, Spectrum, for winning the Chairman’s Award at the Lone Star Regional. All in all, the team is happy with their performance at the 15th Annual Lone Star Regional. We would like to thank all of the Lone Star Region administration and volunteers for all of their hard work in making this such an amazing, well-organized event. Of course, we congratulate the 1st seeded alliance for their well-fought victory and thank our own alliance partners for all of their effort. We can’t wait to see many of these teams again at the World Championship! Lone Star Regional — This Weekend! Texas Torque is proud to announce that it will be attending the Lone Star Regional this upcoming weekend! The event will take held from Friday, April 4 to Sunday, April 6 in traditional FRC fashion; while the first day will be mostly practice matches and robot maintenance, Saturday and Sunday will include scheduled matches and awards, with the highly intense eliminations matches held on Sunday afternoon. In addition to high-powered teams in the state of Texas, the regional will include three teams from Mexico and two teams from China. We highly encourage everyone to come to support Texas Torque and the other teams, as this one one of the last events in the FRC season before the World Championship. And, of course, who doesn’t want to see robots? For more information, visit the webpage for the Lone Star Regional on the Texas FIRST website. Comments Off on Lone Star Regional — This Weekend! This weekend, members from Texas Torque, the Robowranglers, and CRyptonite met at the Johnson Space Center, headquarters of FRC 118, the Robonauts, to prepare for the next event — the Lone Star Regional. From morning to night, dedicated members from all teams worked together to simulate the upcoming matches. Making good use of the Robonauts’ practice field, the teams were able to hold three-on-three matches, even using simple spare robots to play defense. Through this, all the teams’ drivers and operators were able to gain realistic experience on the field. Through the resources and effort provided by all, we were able to benefit greatly from the extra practice. Despite a few mechanical and electrical issues on the robot, Torque engineers made great progress in determining the necessary changes to the robot. Members and mentors of all teams present exchanged ideas and discussed potential strategies to maximize efficiency in the game. 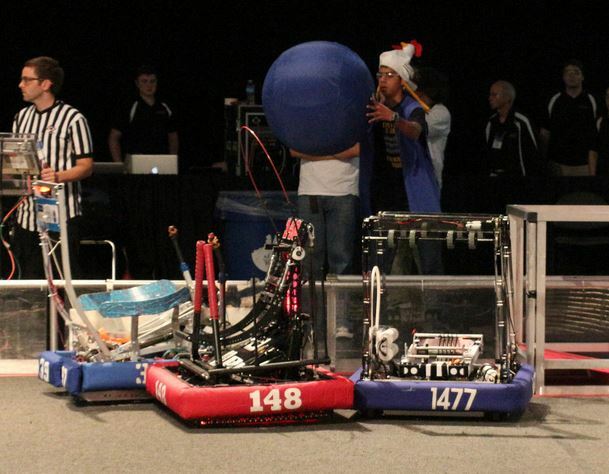 FRC 118 passes the ball to our robot, completing the assist. Without a doubt, the upcoming week will be spent in further preparation for the Lone Star Regional. Our experiences with FRC 118, FRC 148, and FRC 624 were indispensable learning experiences and have helped us to advance significantly. We thank the Robonauts, FRC 118, for offering their home field to these fellow FRC teams in the spirit of Gracious Professionalism and Coopertition. In addition, we are very thankful for all of the time and effort that our fellow teams FRC 624 and FRC 148 put forth in coming out to practice. We can’t wait to see all of these teams and more at Lone Star! 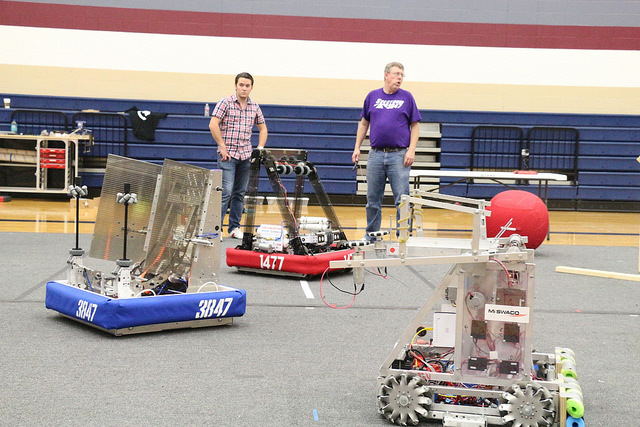 This past weekend, Texas Torque hosted two teams – FRC 3847, Spectrum, and FRC 3335, Cy-Ranch Cyborgs, at our school to get a little extra practice before our Week Six event — the Lone Star Regional. All three teams spent the day at The Woodlands College Park High School, home to Texas Torque World Headquarters. The teams made great use of the practice goals made by Texas Torque. It was exciting to see the progress made by the three teams over the course of the day as they made improvements. (Interestingly, the three teams happen to be the exact same teams that composed the winning alliance at our off-season event, the Houston Robot Remix!) At the same time, scouts and mentors alike took some time to watch the Greater Toronto East Regional. All three robots in the middle of practice. The event certainly helped to prepare us for our next regional event, and we were glad to have shared the experience with our fellow teams. This upcoming week brings plenty of work, but we will continue to make all necessary changes to make sure that we are ready to compete. To see a snapshot of our work over the weekend, see Spectrum’s video through this link.